Karon Living Room Hostel lived near Karon Beach and Karon Center just 700 M. And Karon Temple ( Night Market ) just a 5 Minutes. Phuket Town take the Local Bus at the front of hostel 35 Baht/person. Also, 10 Km to Big Buddha, 15 Minutes to Patong Beach and 45 Km. to Phuket Airport. Finally We service the Private and Dormitory room with Air-Condition. In the reception desk open 24 hr. and we have the Tour & Activities service. The facilities ; Safety Box, Free Wifi, Pool Table, Table Soccer, Garden and Vending Machine etc. Karon living room was fantastic! The staff was amazing and very friendly. The room was very clean and comfortable! The street of the Karon living room has a lot to do Food, smoothies, fresh fruit, massages, a temple with a night market at night. Oh one this I would have wanted to know before is that you have to pay 500thb for the room key which you get back fully when you check out and return the key, which if fine but I had got the the amount of THB for my trip but was out 500 until I left. This is the place to stay if you are looking to avoid the parties. Is a hotel with only 2 dorms, the comum area is not the best but it fits exactly what I needed. Breakfast was included and it was a plus! Staff is very helpful and you can do your own laundry. The room is perfect! Air conditioner all day, good and big beds, Lights, plugs, safe box and curtains in each bed. Showers and toilets are always cleans. So the space seems reduced for fitting 6 adult males. Thankfully there was only one other person staying in the room and I was quite comfortable. They provide a safe for your valuables and an outside locker (with a lock) for your belongings. Clean, efficient and great location for the price. Breakfast provided and very friendly staff. Great rooms, nice beds with curtains for privacy. Every person had their own locker and fridge space. 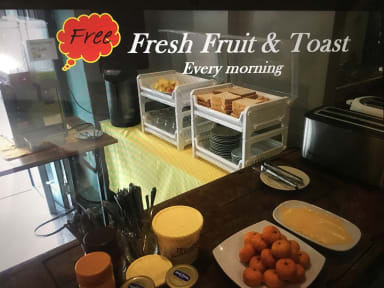 There was a free breakfast and a nice living area. Easy walk to the beach, near to loads of restaurants. The staff were really nice and really helpful. We extended our stay because we liked it so much. Nice place overall. Not super social environment.. The hotel is really welcome, the staff is really loveable and helpful. Everything in my room was working perfectly. The points that can be improved are the room service to clean up the room because in none of the 4 days that I was there anyone from the staff come to clean up the room but this was not a big issue for me, what really annoyed me was that with the room service comes the water and I had to go down and get myself the bottles of water by myself. Booked the hostel for the night as I knew I would be arriving from the airport at 3am. When I arrived there should have been a been a bed for me but instead I had to argue for 30+ mins with the hostel worker who didn’t know how to check me in. Advised me to sleep on the sofa and wait till other staff came at 7am. Eventually managed to get him to check the bed I booked was free and got some sleep. Way too much stress after a flight. Would not stay again. Stayed here for two nights and only ever met two other people staying here. The rooms are cramped and have no windows making it feel like you’re sleeping in a prison or have been kidnapped. The lockers are far from the room and mine had such big gaps in the design of the wire that I could easily stick my hand through and open my pack - not secure at all. It’s also a pretty far walk from the beach and the main area of town. Would not stay here again- I think there are much better options.